Full of melancholy, the Wordsworth party recite Burns’ poetry over his grave in what feels to them a fitting ceremony of remembrance. The party are struck by the view of their native mountains from Burns Country, and the recital (Burns works), the landscape, the physical presence of the corpse, and the feeling of neighbourliness become interlinked in Wordsworth’s mind. (‘Recollections of a Tour Made in Scotland’, August 18th, 1803). Extract from ”A kind of Second Life’: Narrating the Wordsworthian Grave’ a paper I gave at the Wordsworth Summer Conference, 2013. 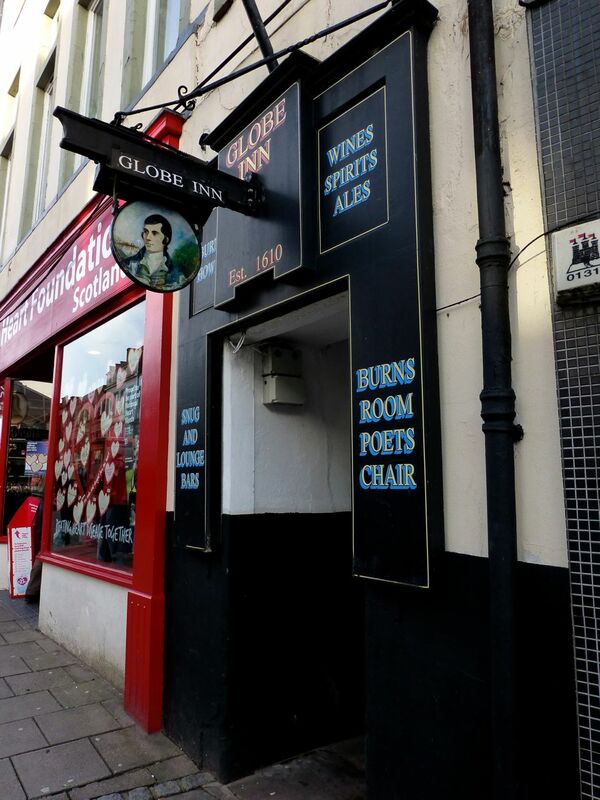 This is the third year that contemporary poems have been displayed on the windows of the Globe Inn, and Coach and Horses Inn, in Dumfries, around Burns’ Night. 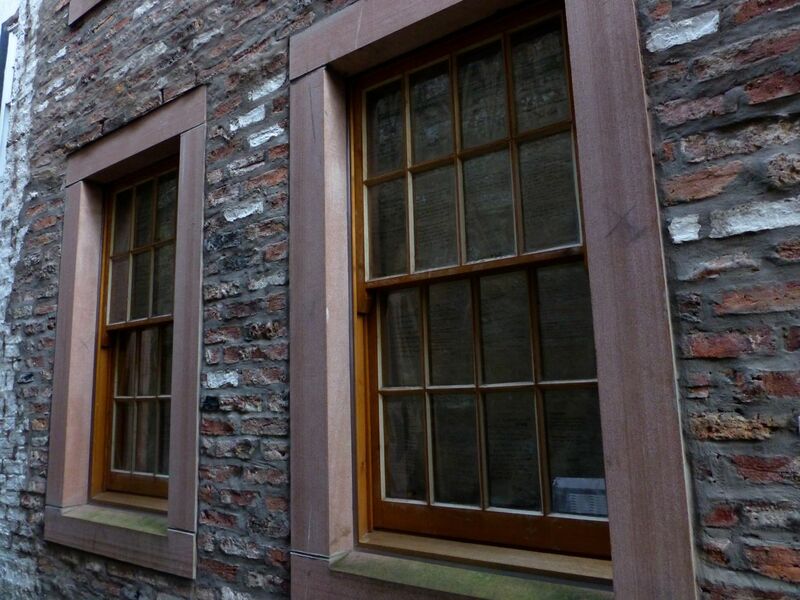 The Burns Windows Project was conceived by Dumfrieshire artist-poet Hugh Bryden of Roncadora Press, and scholar Dave Borthwick (who works on Contemporary Poetry, Scottish Literature and Ecocriticism), as a way to both commemorate and reinvigorate Burns’ own etchings on the windows of the Globe. The aim was to show poetry and Burns’ heritage were both alive and well in Dumfries and beyond. Last year, I was asked to write a review of the project for The British Society for Eighteenth Century Studies website. From the review, you might get an idea of how many of my passions intersect with this project – a scholarly concern with literary tourism and how literary places become significant sites, muddled up with interest in placing contemporary poetry in the community; placing contemporary poetry in sites of historical literary significance; poetry as inscription/artefact/art. What might not be clear is my personal attachment to Dumfries. My beloved maternal grandfather, Nicky Muir, was born in Dumfries, and was deeply proud of the Burns’ connection. He grew up on the street leading to Burns’ grave. When he married my grandmother, Peggy, they made their home in Eastriggs, where I spent many happy visits. My visit to Dumfries to see the Burns’ windows last year was the first time I had spent a day there since my Grandmother died. It was a good way to revisit. We could think of little else but poor Burns, and his moving about on that unpoetic ground. […] there is no thought surviving in connexion with Burns’s daily life that is not heart-depressing. where I slept like a wolf in granny’s bed and ate granny-smith apples. and her face, her face so strange, white like the white apple flesh. 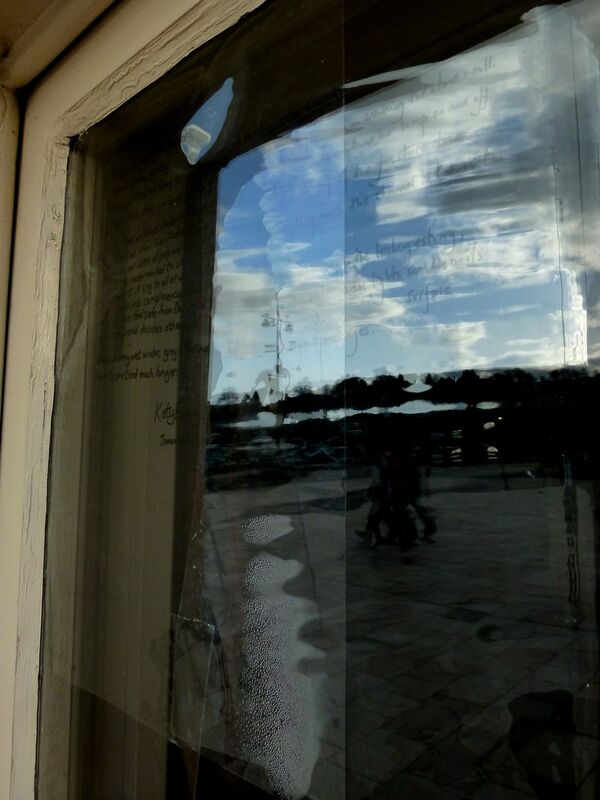 Before Christmas, I found out that my poem ‘Forecast’, displayed as part of last year’s Burns Windows Project, had been chosen to be this year’s permanent addition to the Globe. 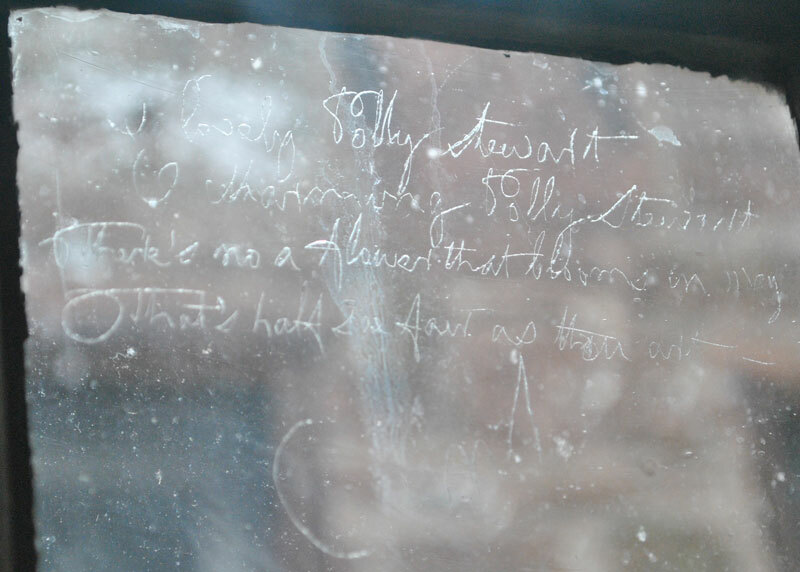 It’s a very strange thing to think of my words being etched onto glass and installed in such a site of literary significance. Even stranger to wonder what my grandparents would’ve made of it. Maybe it’s particularly fitting that one of Burns’ own verses was praising the charms of a long-dead Polly. So today, I been sitting on my side of the mountains in Wordsworth Country, and thinking of Burns, Dumfries, and my own Dumfrieshire antecedents (Blacklocks and Muirs, mostly stone masons and farm-workers). I’ve been thinking particularly about neighbourliness, poetry, place and belonging, and where and how these things intersect. If you can get to Dumfries to see the poems displayed, do. 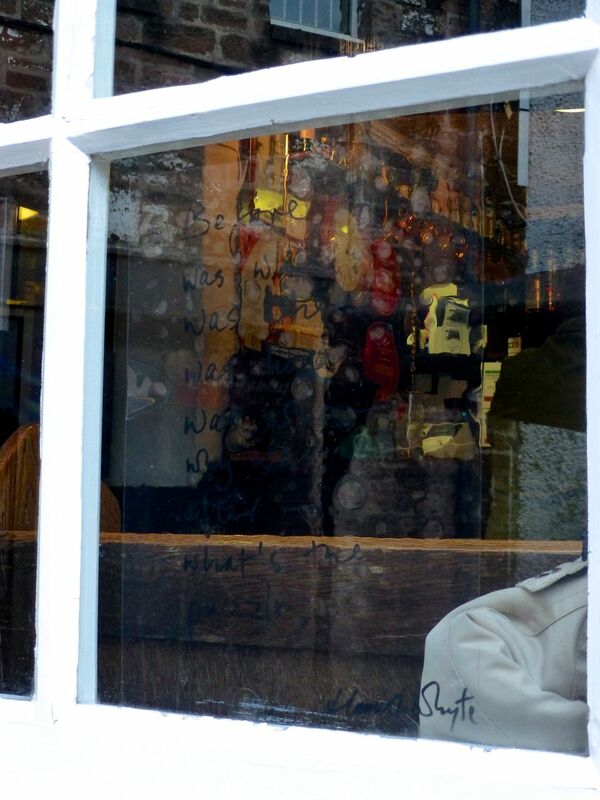 There is something magic about the poems flickering in the pub windows; the words read through the reflections. 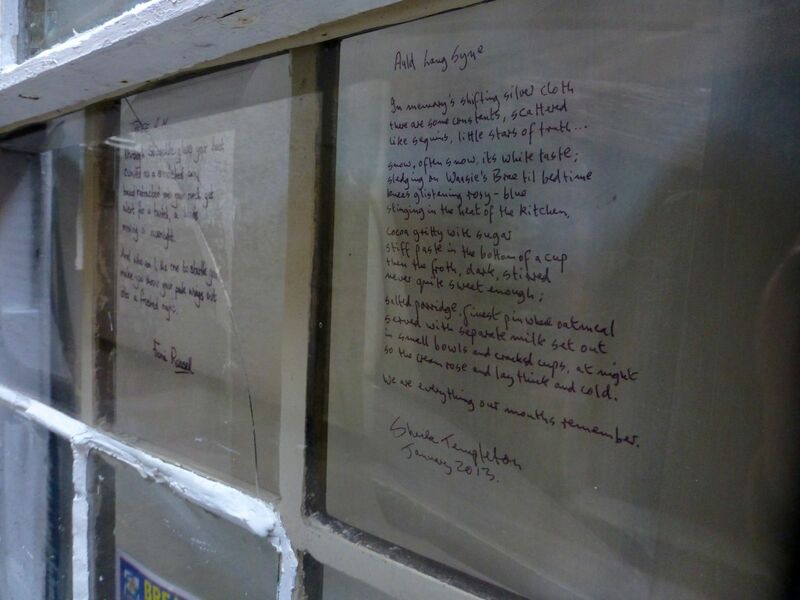 If you can’t, why not order Roncadora’s beautiful hand-stitched pamphlet of last year’s window poems?